Note: I did not like the way I first wrote this post so I have re-written it extensively. 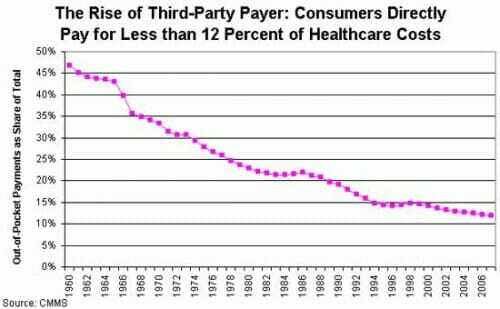 Progressives are passing around this chart from Brookings as an indicator of "what is wrong" with the US healthcare system. In other words, the supposed advantage of PRT—that it targets cancers more precisely and has fewer toxic side effects—doesn't seem to be true. It might be better in certain very specialized cases, but not for garden variety prostate cancer. And yet, new facilities are being constructed at a breakneck pace. Why? Because if they build them, patients will come. "They're simply done to generate profits," says health care advisor Ezekiel Emanuel. Roger that. The competitors in this industry are all making investments in this technology so rapidly that the industry is exponentially over-saturating with capacity. And from these two facts they conclude that the profits of industry competitors will increase?? Let's for a moment say this is true -- an enormous investment that has no customer utility and that is made by so many players that the market is quickly over-saturated actually increases industry profits. Let's take a moment to recognize that this is BIZARRE. We have to be suspicious of some structural issue for something so bizarre to happen. As is typical of progressives, their diagnosis seems to be that private actors are somehow at fault for being bad people to make these investments. But these same private actors, even if they wanted to, could never make this work in any other industry, and besides there is no evidence that hospital managers are any worse people than, say, cookie company managers. The problem is that we have fashioned a bizarre system through heavy government intervention that apparently makes these pointless investments sensible to otherwise rational actors. One problem is that in any normal industry, consumers would simply refuse to buy, or at least refuse to pay a very high price, for services that have little or no value. But in health care, we have completely eliminated any consumer visibility to prices. Worse, we have eliminated any incentive for them to care about prices or really even the utility of a given procedure. 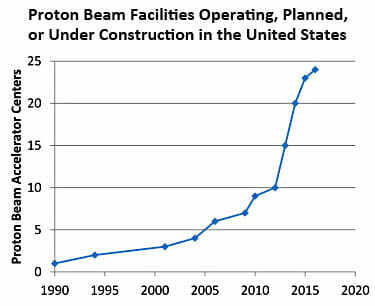 This proton beam thingie might improve my outcomes 1%? Why not, it's not costing me anything. Perhaps the biggest problem in health care is that the consumer has no incentive to shop. Obamacare does nothing to fix this issue, and in fact if anything is taking us further away from consumer shopping and price transparency by working to kill high deductible health insurance and HSA's. There is only one other industry I can think of where capital investment, even stupid capital investment, automatically translates to more profits, and that is the regulated utility business. And that is what hospitals have become -- regulated utilities that get nearly automatic returns on investment. In a truly free market, if these investments made no sense, one would expect very soon a reckoning as those who made these nutty investments go bankrupt. But they obviously don't expect this. They expect that even if it turns out to be a bad investment, they will use their political ties to get these costs built into their rate base (essentially built into reimbursement rates). If any private or public entity refuses to pay, you just run around screaming to the media that they want to deny old people care and let sick people die. Further, the government can't let large hospitals go bankrupt because it has already artificially limited their supply through certificate of need processes in most parts of the country. The much more reasonable solution, of course, is to handle these issues the same way we do in cookies and virtually every other product -- let consumers make price-value tradeoffs with their own money. Obamacare Lowest Cost Health Plan at $20,000 per Year? The IRS's assumption that the cheapest plan for a family will cost $20,000 per year is found in examples the IRS gives to help people understand how to calculate the penalty they will need to pay the government if they do not buy a mandated health plan. The examples point to families of four and families of five, both of which the IRS expects in its assumptions to pay a minimum of $20,000 per year for a bronze plan. “The annual national average bronze plan premium for a family of 5 (2 adults, 3 children) is $20,000,” the regulation says. Bronze will be the lowest tier health-insurance plan available under Obamacare--after Silver, Gold, and Platinum. So is this unusual? Not really. The average cost of healthcare coverage for a family is currently about $16,000,and by 2015 (the base year for the IRS examples) that will probably be around $18,000 or so. And that's for employer-sponsored plans. Individual plans are generally steeper, so $20,000 isn't a bad guess. It might be a little high, but not by much. And the family in question will, of course, be eligible for generous subsidies that bring this cost down substantially, thanks to the Affordable Care Act. They won't actually pay $20,000 per year. I can't believe that Drum has actually shopped for health insurance of late. The link he relies on for his data is for employer plans only, and Drum makes the unproven assumption that these are somehow less costly than individual plans people have to actually shop for. This is false. Employer plan averages include a lot of gold-plated policies in the mix driven by noncompetitive union contracts and executives wanting gold-plated plans for themselves at the expense of shareholders. I would argue that Drum is comparing "platinum" plans today to "bronze" plans under Obamacare, and it should be disturbing that even with this bit of judo, bronze Obamacare plans come out 20%+ more expensive than gold-plated current corporate plans. Note first that these high deductible and HSA policies are ILLEGAL under Obamacare, in large part because they are actual insurance and Progressives don't mean "insurance" when they say "health insurance", they mean fully pre-paid all-encompassing medical care. I consider the purpose of insurance to be to protect from catastrophes that you can't afford (e.g. your house burns down). In the case of medical care, I thought about from my financial position, and determined what the largest financial setback I could bear in a year if someone really had a medical problem. So I set my deductible at that number, and made sure I bought a policy that paid everything else above that reliably, without any low lifetime or maximum payment numbers. The Blue Optimum above is a fairly standard co-pay plan that covers most doctor visits and drugs with only a copay. The Blue Portfolio are HSA plans that are pure insurance. I pay everything (except certain preventative care costs) up to the deductible, and they pay everything else above that. In this case, note that the deductible is per person but there is a total family/policy deductible of twice that. In other words, with the second policy, even if everyone in my family gets cancer in the same year, we aren't out of pocket more than $6,000. So, for this middle policy, in typical years we spend $8,445.60 plus, say, another $1000 on miscellaneous stuff for a total health cost of $9,445.60. Or half the Obamacare "bronze" or cheapest possible plan. In the worst possible year, if two family members get very sick in the same year (not a hugely likely event) we are out $14,445.60 per year. This is the worst case. Still 28% lower than the cheapest Obamacare option. In this plan, I am allowed under the HSA provision to bank about $5,000 a year in a pre-tax account. I can use this money to pay medical bills up to the deductible, or save it. If money is left over some day, it becomes a retirement account and I can use the money for retirement. So I have the financial incentive to shop around for best prices, because the residual in the HSA is mine to spend on .... whatever. I have told the stories a number of times here about my medical shopping experience. X-rays that were charged to insurance companies for $250 suddenly cost $45 when I said I was paying cash. My wife got a 70% cost reduction the other day on orthodic shoes when she offered to pay cash rather than put her insurance in play. So, not only will Obamacare raise the prices of my insurance substantially, it will also raise medical costs in general by stripping away the last incentives for anyone to price-shop for health care. When I read my Bastiat, I am always reminded how humans tend to insist on adopting the same myths and fallacies about the economy. The myths he busts in the 19th century can be seen on the pages of our newspapers every day of the 21st century. But one unique idea we have spawned since Bastiat is this bizarre notion that somehow it is wrong to pay for ones own medical expenses out of pocket. It took forever to convince even my very smart HBS-educated wife that it was a much better deal to go to a high-deductible health plan. Since we did so, we have saved a ton of money, and by the way done our small bit to keep prices down for the rest of you by actually shopping for things like x-rays (you can thank me later). I don't know why this fallacy is so entrenched and hard to change, but we have built the entire edifice of Obamacare on top of it. I am really swamped at work, but I have a number of good things saved that I want to share. State employees enrolled in the consumer-driven plan will save more than $8 million in 2010 compared to their coworkers in the old-fashioned preferred provider organization (PPO) alternative. In the second straight year in which we've been forced to skip salary increases, workers switching to the HSA are adding thousands of dollars to their take-home pay. Most important, we are seeing significant changes in behavior, and consequently lower total costs. In 2009, for example, state workers with the HSA visited emergency rooms and physicians 67% less frequently than co-workers with traditional health care. They were much more likely to use generic drugs than those enrolled in the conventional plan, resulting in an average lower cost per prescription of $18. They were admitted to hospitals less than half as frequently as their colleagues. Differences in health status between the groups account for part of this disparity, but consumer decision-making is, we've found, also a major factor. 3. There has been a lot of good stuff lately on the growing rift between the two America's -- those in government or with access to government patronage and those who actually make a living by being productive. I am increasingly convinced that Obama and Congress are working to create a European-style corporate state, where government insiders, a few large corporations, and a few large unions protect themselves against everyone else. Katherine Mangu-Ward looks at a study of government vs. private pay for the same jobs. It used to be government paid less in return for having to work less hard and being impossible to fire. Now government workers have it all. There are two million civilian federal workers. 1.1 million of them have direct private sector equivalents. 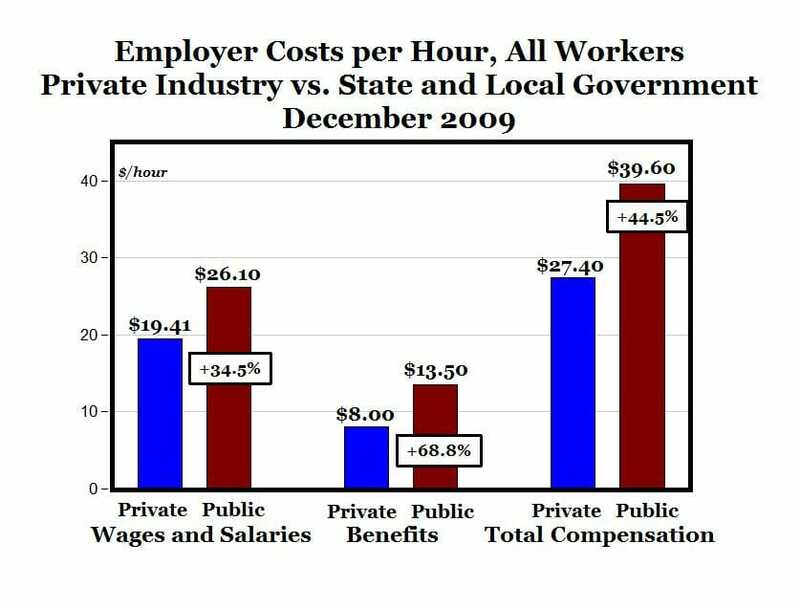 And they are laughing their asses off at those private sector suckers, who are doing similar jobs for less pay"âoften a lot less. "Accountants, nurses, chemists, surveyors, cooks, clerks and janitors are among the wide range of jobs that get paid more on average in the federal government than in the private sector," according to a USA Today report. 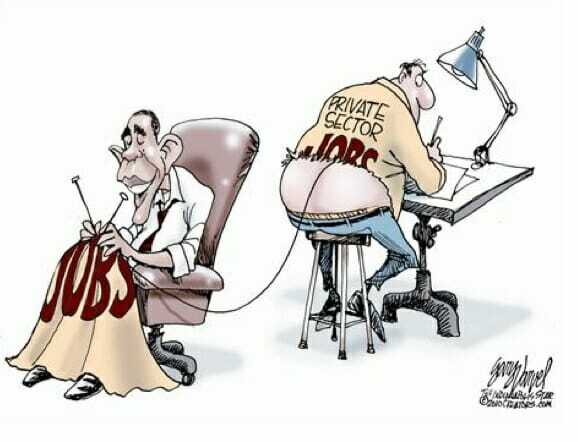 In jobs where there are private equivalents, the feds are earning $7,645 more on average than their private counterparts. Her post has more data. And an update and response to criticisms is here. Mark Perry looks at wage growth, and the difference is amazing. Government employees are the new robber barons, and this time, the title is appropriate. And speaking of the corporate state, this was an interesting essay at the Claremont Institute, via Maggies Farm. Joseph Schumpeter ominously speculated that as capitalism succeeded, democracies in time would come to expect its end (wealth) but reject its means (free-market competition). He worried that because of the inequality and creative destruction it brings, capitalism would provoke a kind of adverse reaction. A popular call would arise for government to plan market outcomes according to some utopian view of society's good, and this democratically guided central planning would inevitably slow economic growth. Schumpeter predicted, in turn, that if economic expansion faltered, individual liberty would be directly imperiled or quietly ceded by citizens resigned to having their diminished economic position protected by the state. The one mistake writers often make is to call capitalism a "system." Capitalism is the un-system. It is the lack of a system. It is the natural self-organization of individuals when they freely follow their own self-interest. In 2004, truck driver Simon Loza Mejia violated company regulations, and took his eight-year-old Diana Yuleidy Loza-Jimenez along on a long-haul trip from Oregon to Bakersfield. That November 27, he was pulling away in the truck, but apparently didn't bother to check where his daughter was, and ran over her. This was, argued her attorneys, the fault of her father's employer"âand a Sacramento County judge agreed with the argument that it was legally irrelevant that her father was the one who ran her over. Unsurprisingly, a jury ignorant of the facts awarded Diana, whose lower body was crushed, a jackpot verdict of $24.3 million. 5. Charter schools in Harlem. Never have so many kids been held hostage to so few, in this case a few union officials and their captive legislators. The United Federation of Teachers and its political acolytes in the New York state legislature are hell-bent on blocking school choice for underprivileged families. Worried that high-performing charters are "saturating" Harlem, State Sen. Bill Perkins and State Assemblyman Keith Wright have backed legislation that would gut state per-pupil funding at charter schools and allow a single charter operator to educate no more than 5% of a district's students. Unions dislike charter schools because many aren't organized. But how does limiting the replication of successful public education models benefit ghetto kids? These obstructionists, Mr. Clark says, aren't doing the community any favors. "The teachers unions ought to be ashamed of themselves because they know better than I do how bad these schools are," he says. "Everybody on my block and in my building and around the corner . . . they all want charter schools. They don't want a political debate." Separately, John Stoessel digs into Diane Ravitch's shilling for the teachers unions. 6. I could have sworn the politicians swore up and down they would never ever interfere with business decisions at GM. "It's not exactly what they wanted to do, and it's always I think a little embarrassing when you have to make changes based on an arbitration process, but they've had to adjust and move forward," he said. Well, at least the Congress and the DOT is hammering GM's competitor Toyota, so I guess they can call it even. Welcome to Europe, guys. I have said it before, but this is exactly the kind of BS European nations do all the time - hammering foreign competitors of their domestic politically connected manufacturers in exchange for substantial ability to regulate and modify these companies decisions. Soon to follow - Europe's lower growth rates and higher structural unemployment. 7. Dog bites man: Paul Krugman still a political hack who is willing to eschew everything he knows or has written about economics to support his team. Health policy should focus on making health care of ever-increasing quality available to an ever-increasing number of people. In a free country, people should have the right to refuse health insurance. You know I'm in; after all, I am the one that has said that "universal coverage is as if, in the Great Society public housing programs, everyone in the country, not just the poor, had been required to tear down their current houses and enter monolithic public housing structures." by joining a very structured HMO program). I wrote about the joys of actually shopping for health care under a high-deductible policy here and here. Michael Canon also has a new post on shopping and HSA's here.